Our annual Commercial Open House and the Biggest Sale of the Year is almost here! 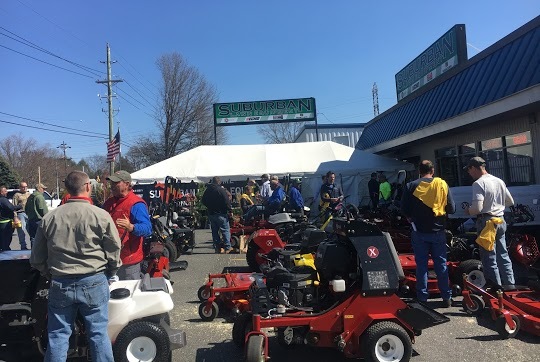 This is truly our favorite time of the year as the staff of Suburban Lawn & Equipment, our dealers, partners, factory representatives, vendors, friends and customers, all come together for a fun-filled day. We’re talking amazing deals on commercial outdoor power equipment, educational seminars, test drives and of course – the food! Can’t be there in person? Make sure to follow our Facebook page for more photos from the event and to stay up to date with our ongoing specials! We hope to see you all at our shop on March 7th from 9am to 4pm! This entry was posted in Commercial Lawn Equipment, commercial outdoor equipment, landscaping business, lawn care, Lawn Mowers, Outdoor Power Equipment, Spring Expo and tagged commercial open house Delaware, commercial outdoor equipment, Spring EXPO, spring sale, Suburban Lawn Equipment's Spring Expo on February 12, 2019 by Suburban.